Always know what you’ll be writing before you sit down. Have an outline, or at least a topic, ready to go. This saves all that “settling in” time that usually is wasted. Only write about things you’re excited to share. These are the things that feel like they “write themselves” or at least flow more quickly. Bonus: they’re the posts your readers are more excited to read, too. Use apps that help. Try a dictation app on your smartphone to capture ideas and drafts on the go. Use an app like Evernote that lets you pick up where you left off writing, from any device. Write in short bursts, whenever your can find 5 minutes. What can you write in just 5 minutes? Brainstorm 5 new headlines on one topic. Write an outline for one article. Write one section of an article you’ve outlined. Shoot a photo, write a caption, and post it as a blog post. It’s a chat held on Twitter, every Sunday evening at 8pm Central. Anyone can participate, and no one is considered an “expert.” Anyone can ask or answer questions. Because so many people participate, there are lots of conversations going on at once. If you go to Tweetchat, it will help you keep track of the chat. The host is Mack Collier, a small town guy and a smart guy. I keep a spreadsheet of topic ideas running so that a) I have a place to jot something down on when the inspiration strikes, and b) when I have a few free minutes and want to write, I can check there for ideas and to see what resonates with me that day. Another source of inspiration is the practice of writing down ideas as explained by James Altucher (http://www.jamesaltucher.com/2012/04/how-to-have-great-ideas/). Do that with regularity, and pretty soon, you’ll have to *make* time to write, as you’ll have ideas pouring out of your ears. Jason, those are great… um… ideas! 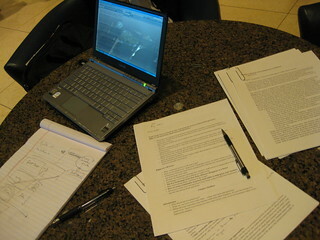 I keep all my blog post ideas in Evernote, so I can work on them whenever and where ever I am. And the article on ideas is fascinating. Thanks! Hey Becky, thanks for the #Blogchat mention, always appreciate how helpful you are there! Here’s something I learned completely by accident, and it might not work for everyone. BUT…last year I made a commitment to myself that I was going to blog every weekend in January, 5 times a week. Mainly, I wanted to see if this would have any impact on my search traffic. But I was honestly worried about doing it because at that time I was only writing 1-2 posts a week, so I had no idea how I’d come up with enough ideas to write 5 times a week! What I found about a week into the experiment was that I had TOO MANY ideas to write about! The more I blogged, the easier the ideas came to me, it was as if I was ‘training’ my mind to look for ‘bloggable moments’ throughout the day. So often something would happen, and I would immediately think ‘that would make a great blog post!’ and write one up in 10-15 minutes. Not saying that will work for everyone, but for me giving myself that deadline of needing 1 new post a day really helped me focus my thoughts. Happy Holidays! Thanks, Mack! I’ve found a similar trend: the more I write, the more I have to write about. The times when I’m not writing are the times I when I can’t think of any ideas.